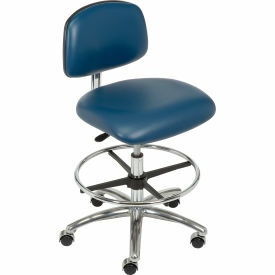 Clean room stools are used for sterile environments where it is critical that no particles or dust are in the air. Our clean room chairs have been tested to Fed Std.209E and ISO 14644-1 requirements (Class 10/ISO Class 4), ensuring the clean quality of the chair. Ergonomic benefits include an adjustable back rest with lumbar support for increased comfort during extended sitting durations, contoured waterfall design, antimicrobial/antibacterial vinyl and molded polyurethane cushioning. The 5-leg polished cast aluminum base prevents tipping, and is designed specifically for use in clean room environments. Comes with chrome hooded casters.